This collection of papers from the NIESR conference at the British Academy identifies the channels through which inward investment can affect host economies, and combines innovative methodologies and firm-level data to enable empirical evaluation of the impact of inward investmen... read full description below. This collection of papers from the NIESR conference at the British Academy identifies the channels through which inward investment can affect host economies, and provides quantitative evidence on the extent to which inward investment has acted to shape the size and structure of industrialized economies over the last decade. Authors in the fields of international investment and the behaviour of national and multinational firms combine innovative methodologies and firm level data to enable empirical evaluation of the impact of inward investment. Detailed studies of aspects of inward investment in the UK are put into context through a review of existing literature and by comparison of UK developments to those experienced by French, Italian, German and US economies. NIGEL PAIN is a Senior Research Fellow at the National Institute of Economic and Social Research. His duties include the direction of a team of researchers in the production of the forecasts and commentary on the world economy published in the National Institute Economic Review every quarter. His research interests include economic integration in the European Union and the transition economies; the determinants of the location of economic activities; the impact of foreign direct investment and multinational firms on national labour markets and growth prospects. Before joining NIESR he worked at HM Treasury. He has published widely, including papers in The Economic Journal, European Economic Review and the Review of Economics and Statistics. 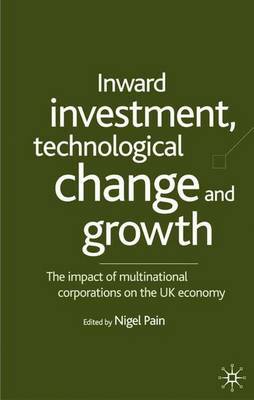 AE(00): Nigel Pain co-edited and contributed to Innovation, Investment and the Diffusion of Technology in Europe published by Cambridge University Press in 1999, and to Capital Market Liberalisation in Europe, published by Kogan Page in 1997.